Supreme Court is doing a superb task protecting the interest of the buyers and here comes a good order from Supreme court that home developer one sided agreement can not be binding as a buyer does not have a choice. Kudos. 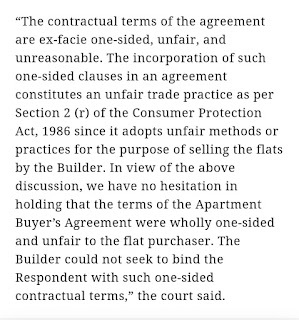 In a remarkable judgment, the Supreme Court has recently held that one-sided clauses in the Apartment Buyer’s Agreement constitutes unfair trade practice and such terms cannot bind the flat-purchaser. The present appeal challenged National Consumer Dispute Redressal Commission’s (National Commission) order, whereby the National Commission directed the Appellant builder to refund the stipulated amount deposited by the Respondent home buyer along with interest towards compensation. Brief Facts of the case: According to the terms of the builder-buyer agreement, the Appellant Builder had to apply for the Occupancy Certificate within 39 months from the date of excavation, with a grace period of 180 days. However, the builder failed to apply for the Occupancy Certificate with the stipulated period and consequently the respondent filed a Consumer Complaint before the National Commission alleging deficiency of service. The National Commission in view of the facts and circumstances in the case held the clauses in the Agreement to be wholly one sided, unfair, and not binding on the Respondent – Flat Purchaser and accordingly directed the builder refund the amount alongwith Interest towards compensation. Aggrieved by National Commission’s order, the Appellant builder approached the Supreme Court and alleged that the Flat Purchaser was not entitled to refund of the amount deposited, since the Apartment Buyer’s Agreement was not terminated by the Respondent – Flat Purchaser in accordance with Clause 11.5 (ii) of the Agreement, which stipulates that the allottee has to terminate the Agreement by giving a Termination Notice of 90 days to the Developer. The Supreme Court while referring to it’s judgment in the case of Fortune Infrastructure & Anr. v. Trevor D’Lima & Ors., held that a person cannot be made to wait indefinitely for possession of the flat allotted to him, and is entitled to seek refund of the amount paid by him, along with compensation. In context of the facts of the present case and the clauses of the impugned Agreement, the Supreme Court was of the view that the Respondent – Flat Purchaser had made out a clear case of deficiency of service on the part of the Appellant – Builder. The Respondent – Flat Purchaser was justified in terminating the Apartment Buyer’s Agreement by filing the Consumer Complaint, and cannot be compelled to accept the possession whenever it is offered by the Builder. The Respondent – Purchaser was legally entitled to seek refund of the money deposited by him along with appropriate compensation. The Supreme Court while referring to the Apartment Buyer’s Agreement in the present case observed that the Agreement revealed stark incongruities between the remedies available to both the parties. The Court thus held in the case that a term of a contract will not be final and binding if it is shown that the flat purchasers had no option but to sign on the dotted line, on a contract framed by the builder. 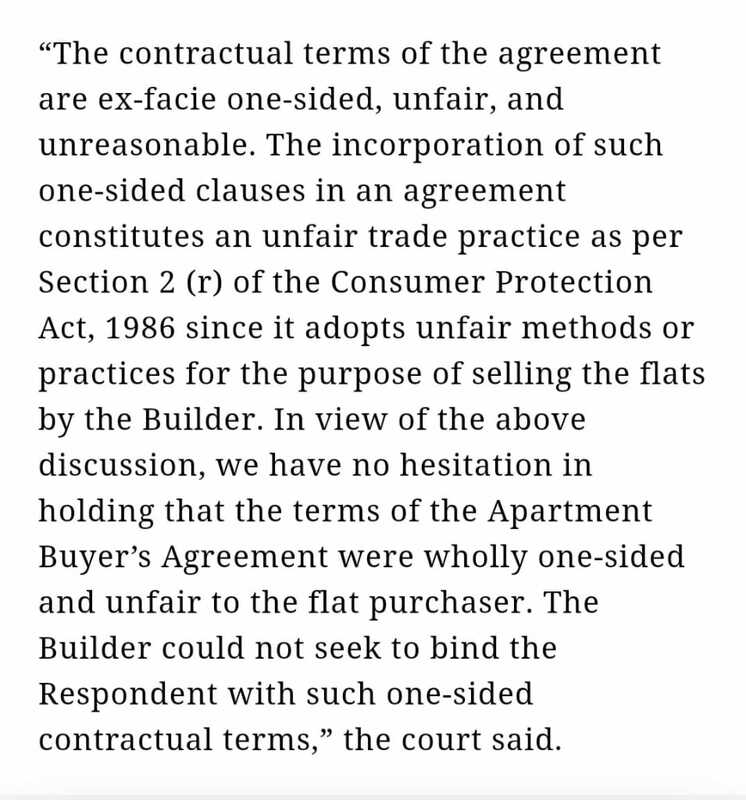 Hence, in view of the aforesaid observations, the Apex Court held that the terms of the Apartment Buyer’s Agreement in the present case were wholly one-sided and unfair to the Respondent – Flat Purchaser and that the Appellant – Builder could not seek to bind the Respondent with such one-sided contractual terms. We thank Supreme Court for a remarkable judgement and hope home buyers can have a sound sleep like our stock trading clients are able to get best results using our intraday tips for today which yield them fantastic returns well in time by 11 AM every day.